Johanna Konta kept her tournament run alive with another impressive victory at the Mubadala Silicon Valley Classic Wednesday afternoon. The 2016 champion had some troubles early on but showed poise and defense against Sofia Kenin in a 6-1, 6-4 win on Stadium Court at the San Jose State Tennis Center. The Brit earned one of her best career victories, taking down a struggling Serena Williams in straight sets. 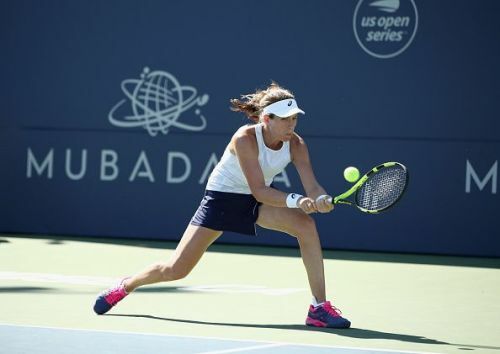 While it was the worst loss for the former world number one, Konta enjoyed the good start in the opening round and prepared for her first match against Kenin. The American battled against Veronica Cepede where she won in straight sets giving up eight games. It marked her first challenge of the new tournament in hopes that she can pull a second straight victory for herself. She started off with a double fault finding herself in a whole that she got out of to force deuce. Konta didn’t waste too much time gripping the AD point to put the game away with a hard winner. Kenin had a worse service as Konta delivered big returns that made it difficult for the Russian teen. While one aspect of her game was kept in check, Konta still had trouble locking down the service which was at 22 percent. She managed to get out of trouble in the third to keep Kenin scoreless after three. The Russian made it on the board in the fourth, putting together a strong service game but was still trailing three games as Konta delivered an improvement of the first serve. It put the pressure on Kenin to deliver or face a struggling journey. Konta fell back on serve but rallied back to force deuce and go for the set. With an ace for the AD point, the 27-year-old scored another one that brought a close to the first in 36 minutes. Konta's offense held above 60 percent while making the second serve returns trouble Kenin. After taking a conference call with her coach during the set changeover, the 19-year-old put down her first service hold to start the second. She soon faced the hard-hitting ball placements of the Brit who matched her. They stayed on serve through four until Konta achieved the break in the fifth. The 28-year-old opened the gap with her service hold in the sixth. Unwilling to give up another game, Kenin fought tough on serve to get back within reach. She stayed on serve that allowed her to continue playing and go for a set extension. Konta gained her chance to serve for the match but watched as the Russian brought some tricks to get into the game. She couldn’t hold on for long as Konta delivered the knockout shot that came back long ending the match in 1 hour and 10 minutes. "I’m just happy to have recovered well last night and come back out here today and compete well," Konta said to Andrew Krasny after the match. "I think more than anything I was just trying to keep things simple and trust in the things that I do well and really just play the opponent today and try to do the best with what I have." She'll get the day off before preparing for her quarterfinal Friday against fourth-seeded Elise Mertens.